This auction is for 1 - Activity Zone Playcenter. 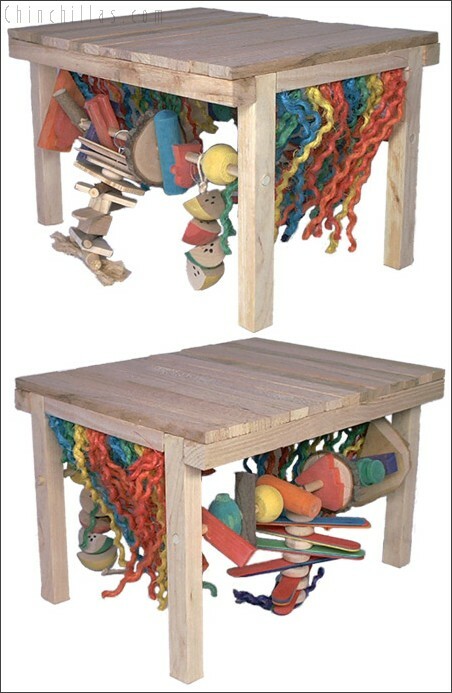 This play center is loaded with toys, chews, and sisal. The dimensions are approximately 10" high, 12" wide, and 16" long. The slats we use to make the top are of varying thickness so as to allow extra traction. The sisal curtains we have added are extra fun and chewable while the many toys encourage playing and gnawing. The Activity Zone shown is an example of what you will be receiving. Since all of our centers are hand made please allow for differences in individual units. Chinchilla's teeth continually grow. Chinchillas can help keep their teeth trimmed by chewing on wood toys. Toys provide mental stimulation, physical exercise, and a natural outlet for stress. We recommend rotating toys every week to maintain your chinchilla's interest and curiosity. We offer a wide range of toys to keep your chinchilla(s) constantly entertained. We also encourage people to purchase a play center for their small pets. Play centers give chinchillas a safe place to play and hide, both in and out of their enclosures. Rabbits, and other members of the rodent family also love to chew and play. Our toys are safe for them as well.